Resembling a Fourth of July skyrocket, Herbig-Haro 110 is a geyser of hot gas from a newborn star that splashes up against and ricochets off the dense core of a cloud of molecular hydrogen. Resembling a Fourth of July skyrocket, Herbig-Haro 110 is a geyser of hot gas from a newborn star that splashes up against and ricochets off the dense core of a cloud of molecular hydrogen in this cool space wallpaper. Although the plumes of gas look like whiffs of smoke, they are actually billions of times less dense than the smoke from a July 4 firework. 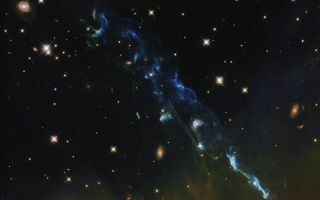 This Hubble Space Telescope photo shows the integrated light from plumes, which are light-years across.